The GPK Halloween set is the 14th online exclusive Garbage Pail Kids Apple Pie set released by Topps. 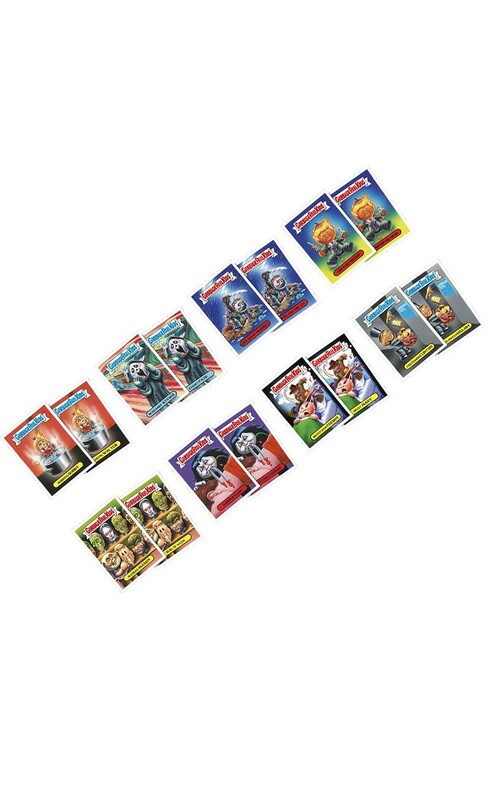 This mini-set features some fantastic Halloween-themed GPK. This set was available for a limited time and could only be purchased directly from the Topps website. Cards include 1ab - TRUMP-kin Head/Trick or TRUMP: 457, 2ab - Halloween HILLARY/Costumed CLINTON: 454, 3ab - JAY Son of Voorhees/FRYE Day the 13th: 473, 4ab - Phantasm FREDDY/Night MARY: 454, 5ab - Screamin' STEWIE/Ghost FAYE: 443, 6ab - VANNA Vamp/Succubus SUSAN: 445, 7ab - Bobbing BOBBY/Boiling WALTER: 443, and 8ab - Masked MASON/HAL O. Ween: 457. The GPK Halloween set is the 14th online exclusive Garbage Pail Kids Apple Pie set released by Topps. Cards include 1ab - TRUMP-kin Head/Trick or TRUMP: 457, 2ab - Halloween HILLARY/Costumed CLINTON: 454, 3ab - JAY Son of Voorhees/FRYE Day the 13th: 473, 4ab - Phantasm FREDDY/Night MARY: 454, 5ab - Screamin' STEWIE/Ghost FAYE: 443, 6ab - VANNA Vamp/Succubus SUSAN: 445, 7ab - Bobbing BOBBY/Boiling WALTER: 443, and 8ab - Masked MASON/HAL O. Ween: 457.